The UV MAX range extends beyond domestic drinking water applications to light commercial as models are available that can treat flows of 18m³/hour. The high output germicidal lamps provide an economical way of treating water requiring a 99.99% reduction in bacteria and viruses. This process is accomplished without adding any potentially harmful chemicals to your drinking water. Higher flow models use amalgam technology that has at least twice the life of regular and High Output low pressure lamps. Their simplified designs allows for easy maintenance, without compromising performance and without the need for tools. The UV lamp can be changed without interrupting the water flow. The quartz sleeve design allows for maximum UV output and operating efficiency. the life of the lamp (9000-16000 hours, dependant on model) to ensure continuous disinfection. output. The controller will go into alarm if the lamp fails for any reason to notify you of the failure. and other performance parameters for up to nine systems. quality that may cause the water to become unsafe to drink. monitor indicates the water may be unsafe to drink. In addition to bacteria (E. coli), virus, algae, mould and others, Sterilight UV systems are effective against protozoa such as Cryptosporidium and Giardia lamblia. UV effectively destroys these protozoan cysts at dosage levels well within the levels delivered by all UVMAX ultraviolet disinfection systems. 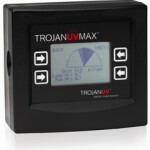 The TrojanUVMax comes with a premium package of full, three year warranty against manufacture’s defects on the power supply and all electrical components; a ten year guarantee on the water chamber; and a one year warranty on lamps, quartz sleeves and sensors. Please see the Warranty PDF file for full details. See the table below for flow rates suitable for domestic applications. Higher flow rates are available so give us a call on 01932 852423, email sales@kkwater.com or complete the website enquiry form below. 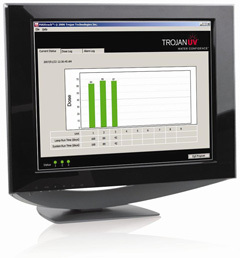 COMMcenter unit for Pro series systems displays UV dose in real-time, alarm history, lamp hours, and other performance parameters for up to nine systems.